What is Rose Oil ? Attar of rose is the steam-extracted essential oil from rose flowers that has been used in perfumes for centuries. It was between 1582 and 1612 that the oil or OTTO OF ROSES was discovered, as recorded in two separate histories of the Grand Moguls. Attar of rose is one of the oldest and best known of all the oils. Classic rose is the aroma of love. It is warm, intense, immensely rich and rosy. Rose oil is very expensive, however only a few precious drops are needed to impart the fragrance of pure and natural rose. Sensual and evocative, the rose has been used since ancient times as a favorite ingredient in love potions and as an aphrodisiac. 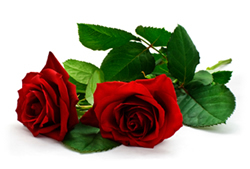 The scent of roses is a time honored anti-depressant and creates a feeling of well being and mild euphoria. It reduces anxiety connected with intimacy, helping calms emotions that block arousal. Rose petals suitable for medicinal purposes must yield a deep rose-colored, astringent and fragrant infusion when boiling water is poured upon them. Botanical Information - Rituals & History : The Damask rose (Rosa damascena), Provence rose (Rosa Gallica) and Eglantine(Rosa eglanteria) are the three oldest roses in cultivation and are considered to be the most fragrant roses in the world. It takes about 10,000 pounds of flowers to make 1 pound of rose oil, so be aware that if you find rose oil at an unbelievably low price, it is almost certainly an adulteration. In China Rosa rugosa is the source of Chinese Rose Oil, which has a soft, honey like note. The rose plays a prominent role in Greek and Roman mythology, Homer's allusions to it in the Iliad and Odyssey are the earliest records, and Sappho, the Greek poetess, writing in about 600 B.C., crowned the Rose Queen of Flowers. Roses were grown in monastery gardens in the Middle Ages in Europe.